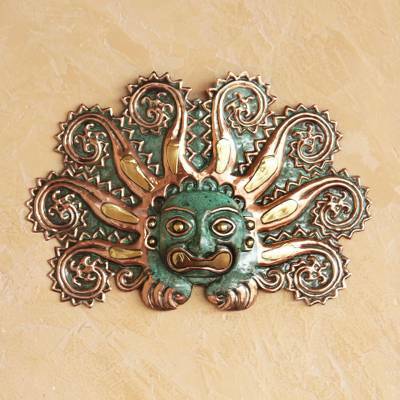 Handmade Bronze and Copper Mask, "Moche Octopus"
Eight waving tentacles crown a mysterious Andean icon. Interpreting an octopus, Angel Franco shapes copper and bronze into a dramatic mask replicating the golden mask of Moche origin. You can find copper and bronze mask 'Moche Octopus' by Angel Franco in masks categories such as Archaeological Masks, Animal Themed Masks, Bronze Masks and Copper Masks. Enjoy exploring these sections for other Novica treasures. Love the piece ! Definitely happy with the style and design !